Michael Trevelyan is determined to claim his inheritance at all costs. Bitterness consumes him and he refuses to forgive those who have betrayed him. Yet, when he meets Alexandra Hope, things begin to change. She challenges his views but also listens while he shares his pain. Can Michael move on from the past and learn to forgive? Can Alexandra hold onto her faith in God as she deals with their deepening relationship? Can they both learn to trust each other - and God? The Inheritance is a stirring story of family secrets, forgiveness and faith - of leaving behind a dark, painful legacy and walking into the light of God's eternal inheritance. Michael Trevelyan is determined to claim his inheritance at all costs. Bitterness consumes him and he refuses to forgive those who have betrayed him. Yet, when he meets Alexandra Hope, things begin to change. She challenges his views but also listens while he shares his pain.Can Michael move on from the past and learn to forgive? Can Alexandra hold onto her faith in God as she deals with their deepening relationship? 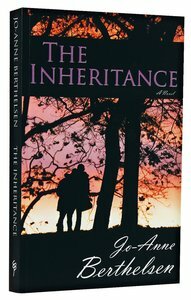 Can they both learn to trust each other--and God?The Inheritance is a stirring story of family secrets, forgiveness and faith--of leaving behind a dark, painful legacy and walking into the light of God's eternal inheritance. About the AuthorJo-Anne Berthelsen is a Sydney based author of six published novels and a memoir, Soul Friend, released in 2012. She holds degrees in Arts and Theology and has worked as a high school teacher and editor, as well as in local church ministry. Jo-Anne is married to a retired minister and has three children and three grandchildren. Jo-Anne Berthelsen is a Sydney based author of six published novels: Helena, All the Days of My Life, Laura, Jenna, Helena's Legacy and The Inheritance. Her first non-fiction work Soul Friend: The story of a shared spiritual journey was released in 2012. She holds degrees in Arts and Theology and has worked as a high school teacher and editor, as well as in local church ministry. Jo-Anne loves communicating through both the written and spoken word. She is married to a retired minister and has three children and three grandchildren. Customer Reviews For "The Inheritance"
First of all, while The Inheritance did not take me on a thrill ride of adventure like most books I tend to read, it did take me on a different kind of journey. An inward journey -- an insight into the way bitterness and unforgiveness can wear away at a heart and life until it even affects a person physically. Michael Trevelyan's character is entirely believeable in that way, and it was good to watch him discover things about himself and learn to change and grow, leaving the past behind him gradually. Alexandra was a warm character although I missed her not being there for much of the second half of the book. Strangely, I did feel like I'd come to a satisfying conclusion just past two chapters from the end, when Michael finally let go of the past. From there on it just felt like winding up details, and I don't think I would have missed that if it wasn't there. All in all, though an enjoyable read. The Inherticance would be a great tool for those who are struggling with a painful past and how to move forward. Michael Trevelyan and his mother have never got along. That relationship was further destroyed by his bitterness over his mother's refusal to believe his sister Miriam's accusations about Uncle Edward and take appropriate action. He also carries his own share of guilt for what he receives as his part in Miriam's death. Michael, a successful orthopaedic surgeon, is bitter and resentful with no time for anyone who does not hold similar views to his own. When his mother, Justine Trevelyan, becomes critically ill, Dr. Alexandra Hope comes into her life. Alexandra is a God fearing young woman who yearns to be a missionary and who is waiting for her visa to go to Ethiopia. Needless to say Michael and Alexandra clash in their views about God, life and his mother, especially given Justine's recent revelations of long held secrets. Even though he wasn't always pleasant at times, I found myself easily drawn into Michael's story. Alexandra is a spirited yet committed believer and I warmed to her immediately. Her father John, also a doctor, is a lovely character too. As a reader I had a sense of where the story was heading but that was okay. The story is really more about the journey these people take. I don't read a lot of Christian fiction but I thought this novel handled some tough issues in a sensitive and honest way. Requesting this book to review, I had no idea what I was in for! Reading the blurb, I was hoping for a romance novel, however those were only my hopes. Yet the quote "He struggles with bitterness and betrayal. She wants to follow God's way. To be together seems impossible" allowed it to be plausible. But the more I read the book, the more I enjoyed the story, I discovered that it was far from my expectations!! It only took me the first couple chapters, really only the first, to be hooked. Berthelsen didn't waste any time in making her way to the heart of the matter, which was Michael's bitterness towards his mother, himself and his 'uncle'. And I have to confess, I didn't side with him to begin with. But Berthelsen's gift of writing smoothly and very competently made the characters and story come to life, causing me to side with Michael, to some extent. However I have to confess, that I found his outgoing ways a little confronting, causing me to be cautious around him, especially where Alexandra was concerned. This was mainly caused by his lack of faith, hence Alexandra's strong faith. Although that said, I find it to be a crucial aspect, because it highlights Michael's transformation! This is the essence of the story. Yes, romance played a role, however minor and I did feel a connection between them, which really highlighted to power of such a relationship. Yet the whole time, I was reminded that the essence of this story is about trusting God; turning from a life of bitterness, unforgiveness and resentment, to a life filled with God, where he is in control. Michael is a prime example of this for he represents the challenges faced in doing so. Reading his experience, I was greatly challenged in my own walk with Christ and know my life has been changed. Basically said, this novel artistically illustrates the power of God's transformation in one's life. It is clear that God guided and had a really big input in the construction of this novel to further his kingdom!! Be blessed as you read this story!